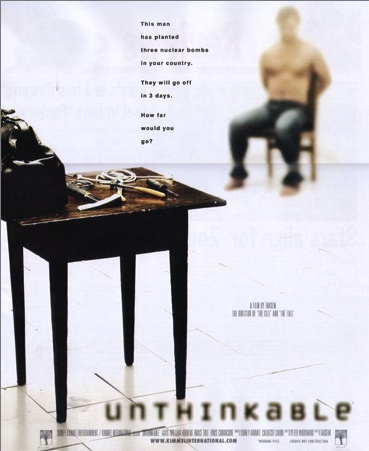 Unthinkable is one of the sickest, most mentally disturbing films in existence. Its deceptive marketing leads one to believe, it is a film about law enforcement honorably prevailing over terrorists. However, it is anything but that. It stars Samuel L. Jackson, as a CIA operative named "H" who is used to interrogate terrorist suspects. However, the film quickly takes a nasty detour into torture. Very grotesque torture, might I add, which does not reflect well on the government or Hollywood for filming this nastiness, as it shall only incite terrorism, not discourage it. Spoiler Alert: There are a group of scenes in which, an American born Muslim convert, named Yusuf, has turned to terrorism and is tortured by the U.S. government in very vicious ways. This makes for very graphic, unpleasant, stomach turning viewing. When Yusuf refuses to break, his Muslim wife and small children are detained and brought into the torture chamber by the government, where he is forced to watch as his spouse's neck is spontaneously, mercilessly and viciously slashed by the CIA operative, leaving her to loudly gasp for air and bleed to death, right before his eyes. Why Hollywood thought it appropriate to bring such a disgusting thing to the screen, testifies to their imprudence, insanity and lack of basic commonsense. How could such a sick film possibly help the U.S. government and America by default. It will only serve to provoke Muslims to rage. The Celluloid Film Review does not recommend this terrible, depraved film. Once again, Hollywood never knows when to quit.